Castor oil has to be up there as one of our best sellers at Naissance, so we thought it would be a great topic to talk about on our blog. This wonder oil can be used as part of a natural health and beauty routine for hair care, skin care and even nail care. Firstly, this oil has been used for thousands of years and its origins are rooted in Africa where it’s thought to have been used by the ancient Egyptians. This viscous oil is extracted from the seeds of the castor plant using the cold pressing method, which means that the oil is extracted through heavy pressure exerted onto the seeds without heat extraction in order to maximise its nutritional content. As this oil is so thick and viscous, sometimes likened to the consistency of honey, it is not often chosen by aromatherapists for massage. If you do however wish to use the oil for massage, it can be mixed with a thinner carrier oil such as jojoba, grapeseed or almond oil. Its anti-inflammatory benefits make it a good choice if you are dealing with inflammatory conditions such as arthritis. Castor oil’s viscous consistency works well as a barrier to protect the skin, and it can also help to fade stretch marks. Since it has also been known to be beneficial to treat acne, you can apply it to acne prone skin or to affected areas using a cotton wool bud as a quick treatment. If you have more time, it can also be massaged into the acne prone areas; this will help to stimulate the skin and to get blood flowing to the area to help speed up the skin’s natural healing process and help to prevent future breakouts. You can also apply the oil to your cuticles and nails to give them a little TLC and help them stay strong and healthy. The anti-fungal properties of the oil will also be beneficial to keep away or help to fight toenail fungal infections. You can even use castor oil on your eyelashes! Take an empty mascara tube and a mascara wand and use a small funnel to decant some castor oil into the tube so you can use it like a mascara. This is an easier way to use castor oil on your eyelashes and eyebrows and to make sure you don’t apply too much, avoiding the oil getting into your eyes. For best results, use this as part of your night-time beauty regime and sleep with the oil on. When done for a few weeks, this little ritual is said to promote growth and fullness of the eyebrows and eyelashes. Castor is a notorious wonder oil for hair care and has widely been used in a whole host of high street hair and beauty care products for its skin and hair-boosting qualities. You can use castor for your hair care routine by simply adding a small amount to your shampoo when you wash your hair as this will help to thicken it. If you have time for a much more enriching treatment, you can apply it all over your hair and scalp as an intensive mask and leave it a few hours before washing it out. Start at the ends working up to the roots. Remember: don’t be too liberal with this oil as it is very thick and less is definitely more. Once you are happy all the oil has been applied, you can chill out and put your feet up for 15 minutes to leave the castor work its beauty magic. (If you prefer, you can use this as an overnight hair mask and wash it out in the morning, but make sure you wrap your hair in something that won’t let the oil get on your bedding). When you wash the oil out of your hair, you may find you need to do a few extra shampoos than you would normally, to ensure you get all the oil out properly, otherwise you will be left with greasy and heavy hair. 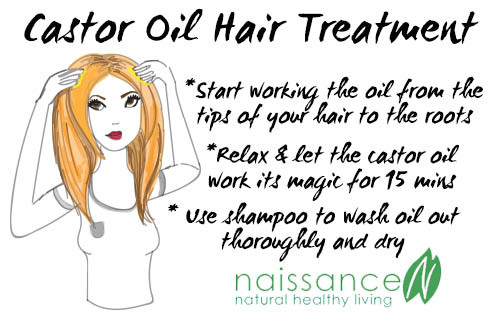 Dry your hair off and enjoy the beautiful soft shine that the castor oil gives to it. Some other interesting reported uses for castor we have found are that it can be used to relieve and also to make heated castor oil packs for the liver and for inflammatory conditions. This oil is even thought to be beneficial for nappy rash due to the viscous skincare barrier it creates. Castor oil is extremely thick and takes a while to absorb into the skin so be careful not to get it on your clothes or bedding as it may stain. You could blend it with a thinner oil like Almond oil or Grapeseed oil try a ratio of 20% castor oil to 80% of the oil of your choice and it should apply and soak in much easier. Or you could use it unblended in small amounts after a shower or bath. Ultimately it will be down to your personal preference so it might be worth trying a few different ways of using it to find the one that suits you the best, we hope this helps if you have any other queries just let us know.